My posse is a bunch of women who are easily 9-15 years younger than me and that’s because I had my children later in life. The current connections I have with my girlfriends began when I became a mother of two. With that said, I’m one of those old timers that could be overheard saying, “Back in my day, I celebrated my 40th birthday by ordering Chinese take out and inviting 20 friends over to my house to drink and celebrate.” Nowadays, gals that turn forty go on a 10 day trip to Mexico or spend the weekend in Nashvegas (that’s Nashville y’all). In August, one of my closest friends, the one who coached me into having a VBAC, turned forty. She always plans really cool things to celebrate her birthday. For example, about 5 years ago, she introduced a few of us to paddle board yoga because that’s how she wanted to spend her special day. Imagine being on a lake, paddling out on a board and finding a great spot to “park” the board to practice yoga. As we stood in Tree pose or laid in Savasana, there were birds above, the water was moving, the sun was shining and a small group of friends on their boards were near by. It was like we received a birthday present even though we were there to celebrate Anne! 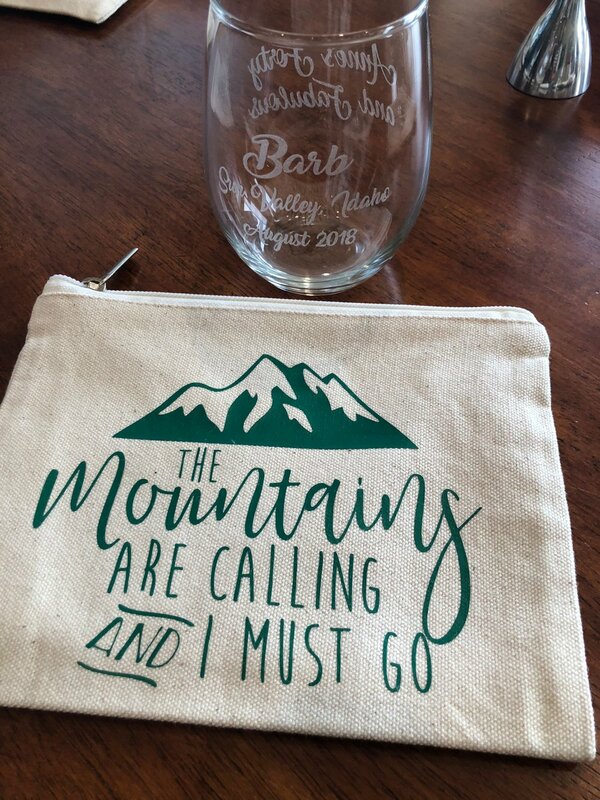 This year, to ring in her fortieth, Anne planned a girls trip to Sun Valley, ID. When she asked us months in advance if the dates would work, I was excited that nothing was on the calendar - I was totally in! The trip sounded perfect because some of my close friends would also be going on the trip. I felt like it was a pre-birthday gift to myself. However, as the date got closer, I realized that I didn’t mark my kids’ First Day of School on the calendar. Darn it! After all that, I could only go for one night and two days. Everyone else got to stay three nights and four days. But I didn’t care that I would only be there for 24 hours. There was no way that I was going to miss Anne’s celebration. The time spent in the airport, the time on the flight and the time driving from the airport to the condo all counted as quality time with my friends. I was very grateful that everyone made the most of the 24 hours that I was there because it made my short visit totally worth it. We all met up at MSP airport. One other friend was flying in from Boston. Our first stop was Utah. After our flight from MSP to Utah to Idaho, we had a quick drive to the condo where we would be staying. The thoughtful pinches pictured below were set up waiting for our arrival. Sara, the friend who flew to ID from Boston, arrived earlier than the rest of us. She brought these wine glasses with her which were specially made for the celebration. Each of our names were etched onto the glasses because Sara said it would save us from guessing who’s glass was who’s. Thoughtful!! And these little zip pouches - so perfect for the occasion. I had only met Sara on this trip but I instantly knew she was a thoughtful pincher* combo of: pro, insightful and celebratory. Anne, the celebrant, gave us goody bags. These tank tops were included in the bags. They were a sneak peak into her Form and Feather concept. We are hoping that Anne was putting it out into the universe that she will do something soon with her brand. Also in the goody bag was a bottle of this stuff. Yes, please! This towel was also included in the goody bag. Once the towel is tucked into the mesh bag, it can be hooked onto a back pack. Handy! Last, but certainly not least, a modern day canteen! Perfect for long hikes! Folks, it was a very generous goody bag! I’m an old timer so I had to ask: do people still give gifts to the milestone celebrant if they have to travel for a destination celebration? If so, should we give a group gift? I’m glad I asked because it was a resounding yes to both questions. In the weeks leading up to the Sun Valley trip, we were trying to decide what to give Anne for her birthday. Before I had thought to ask the group, I had already bought a thoughtful pinch but it only made sense to Anne and I. Giving it as a group gift did not make sense. Besides, it is only a pinch - not a real gift - so splitting the cost would have been silly. I suggested that we get a gift certificate to the Sven clog outlet because I knew Anne had her heart set on a pair of clogs for the winter. I didn’t get an enthusiastic response so for the first time in a long time, I just sat back and let someone else handle the group gift. The feeling of giving up control was both nice and weird at the same time. They put together such a nice gift: a tote bag with the shape of the state of Idaho on it filled with really cool items - including a necklace with a symbol of a tribe charm. I’m glad that Anne really enjoyed the gifts and now I know the etiquette if I’m ever invited to one of these milestone destination getaways again. *more on thoughtful pincher later.